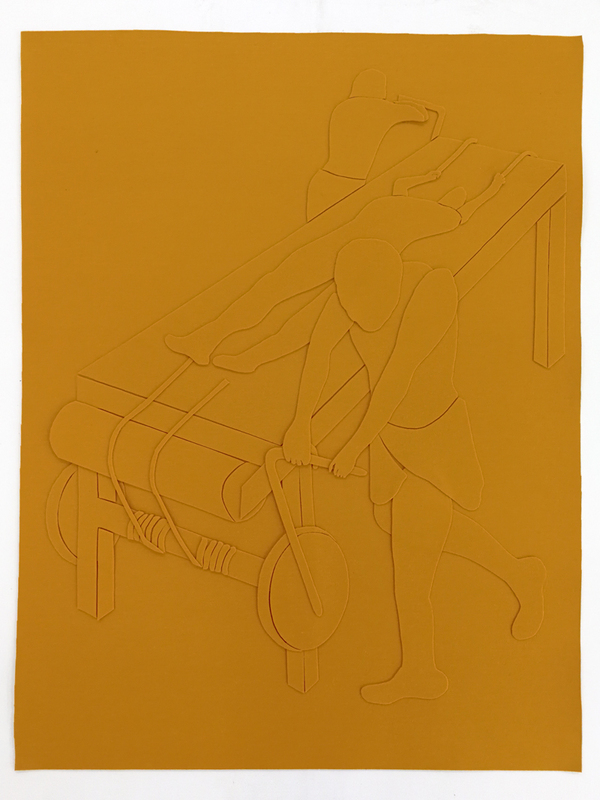 In Contaminant; Figures Spencer Lai presents a new series of felt relief sculptures, a video work, sculptural assemblage, and a recent collaboration with artist Jessie Kiely. Since graduating in 2014, Lai has situated their practice in public, private, and artist-run initiatives; their emergence and repertoires of presentation within these spaces broadly tracing the dissemination of consumerism and it’s affect on a consumer’s consciousness in the contemporary. Their work frequently consists of sculpture, video and animation, installation, writing and performance. Their new exhibition Contaminant; Figures at Fort Delta focuses on processes of craft and sculptural assemblage in historic and contemporary contexts and considers the collectors, hobbyists, and makers which cultural histories classify as ‘outsiders’ to be an act of violence upon the figure. Lai’s interpretation of and for this violence addresses how the severities of civilization play out in static retrospect and how they now continue to advance through technology, real and not-real exploitations of the body, and both the violence and banality stemming from the devout narcissism and self-imaging of our times informing a contemporary anthropology. Recent exhibitions and projects include: AFFADAVIT VITO ACCONCI a group exhibition at Gertrude Glasshouse, curated by Brooke Babington, Melbourne, 2016; mummy has the bends again… a delegated performance as Monica’s Gallery with garments by Jessie Kiely at The Community, Paris, 2016; A Really Good Look - a contribution for TarraWarra Biennial 2016: Endless Circulation enacting as Monica’s Gallery with Jessie Kiely in collaboration with 3ply and Centre for Style, Melbourne, 2016; tell me what you have and I will tell you what you are, a group exhibition and publication as Monica’s Gallery, curated by Dissect Journal, Melbourne, 2016; presenting with Fort Delta at the Spring 1883 art fair, Hotel Windsor, Melbourne, 2016; WORLD INDUSTRIES, a curatorial project Monica’s Gallery with Jessie Kiely at Punk Café (2015); youth, born at brunch (from a wish), a solo exhibition at George Paton Gallery (2015); Monica’s Gallery Presents: The Artist Interprets HIGHPOINT,a curatorial project as Monica’s Gallery at Fort Delta (2014); the smell of an oily rag, a group exhibition at Fort Delta (2015); do you want me to come downstairs, with rollers in my hair?, an exhibition with Jake Swinson at BLINDSIDE (2014).